Not only tasty, but totally on point with your life jacket. 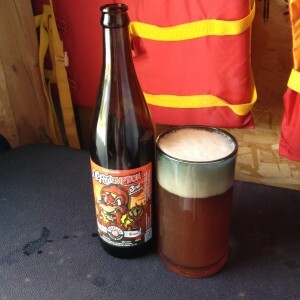 Right now, Parallel 49 Brewing Co.‘s sour beer lineup manages to encompass all three. Even in the variable world of craft beer, sours are strange beasts. Usually fermented with wild yeasts and special bacteria, and sometimes aged for a year or more to develop flavours, these brews can push the limit on what even a reasonable widely-drunk craft beer fan might have encountered in the liquor stores and pubs of Kamloops. Depending on the beer, a sour can offer the same lip-smacking sensation sour mix brings to a cocktail — minus the heavy sugar and dish-soap fake lemon. Parallel 49, out of Victoria, is going heavy on the sours this sumer. So far, I’ve picked up three locally. And, to play into all the beer snob cliches, they seem to get better the more specialized and limited they are. Apricotopus (6.3 per cent ABV) describes itself as a sour saison with apricots, and that’s kind of what it tastes like — in that it’s kind of fruity, kind of wheat-y and kind of tart. While it’s crisp and refreshing thanks to souring bacteria, it’s the least memorable. More interesting is the Sour White Ale (7.5 per cent ABV) out of the brewery’s barrel-aged series, which seems like the perfect beer to buy the avowed wine drinker in your life. Aged in Chardonnay barrels, this wild-yeasted beer’s got the richer mouthfeel of wine, a bit of oak and a note of not-quite-ripe pear. There’s a funkiness here you won’t find in wine (something that’s apparently common with sours), not to mention more carbonation, but drinking it felt like crossing the line into sommelier territory. Different still from both of these is the brewery’s third anniversary offering, Lil Redemption (6.7 per cent ABV), a sour cherry beer that lives up to its description. This beer pours nearly opaque red, with inches of lacing on the glass. It’s got a taste to match, pulpy with the flavour of sour cherries and with a gorgeous earthiness courtesy of its wild yeast. Yet, a good amount of carbonation kept it from feeling overwhelmingly heavy. According to Parallel 49, this one spent two years in Cabernet barrels before the cherries were blended in. While I didn’t pick that up at all in drinking (I’m really not a wine person), the sheer amount of care and time paid off in one of the most complex, interesting sips of the summer. Posted in Beer. Tagged 650, limited release, Parallel 49, Victoria. 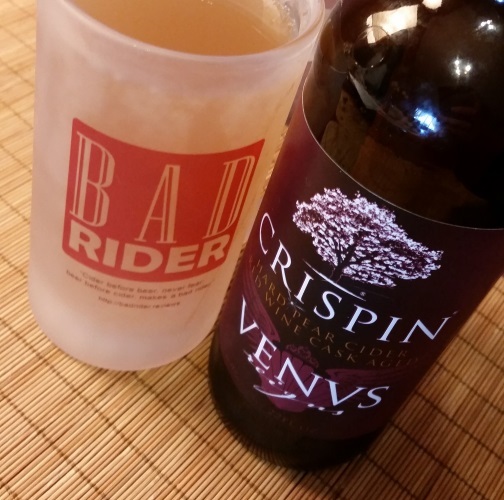 Y’all, Crispin is killing me with these limited releases and fancy pear ciders. I can’t even feel guilty that they’re a big operation owned by MillerCoors, their stuff is just too good. Venus Reigns is a 6.9% ABV pear cider aged in red wine casks and finished with honey — if there exists a cider that is more my jam, I certainly cannot think of it at the moment. The aroma strikes me as more like an apple cider than a perry, but it’s also got a distinct sense of red wine to it. I couldn’t possibly put a specific varietal name to it, but it tastes like a fairly young wine, not something that’s aged for very long. I was halfway expecting a cider aged in red wine casks to turn out more or less pinkish, especially given the name and the lovely purple hues of the label, but Venus Reigns is a cloudy straw-amber color with perhaps a tiny hint of peach blush. The flavor seems like it’s almost on separate levels — on the ground level, the pear cider mingling with red wine notes; on the mezzanine, the sweetness of the honey. It’s a party I could spend a lot of time at. Overall it’s a fairly sweet cider, but though the honey doesn’t have distinct a profile as, say, Methow Valley’s Honey Bear, it’s still more than enough to keep Venus Reigns out of the “generic syrupy sweetness” category. I wouldn’t pair this with anything particularly bitter, but I think it could go well with savory dishes, or perhaps sweet-and-sour. You can locate yourself some Venus Reigns on Crispin’s website, and I definitely recommend it. Crispin, please never stop with these weird limited editions and artisanal releases. Even if I am sad when they go away (RIP Steel Town). Posted in Cider. Tagged 650mL, crispin cider, limited release, pear ciders, venus reigns. Do you like cider? Do you like chai? If someone poured both those things into a single glass would you not immediately recoil in horror but instead entertain a curious thought or two about how the result might taste? If you answered ‘Yes’ to all of the above, congratulations! A) We have something in common, and B) this is the cider chaider for you! It’s really, genuinely, a little surprisingly…not terrible. And I don’t just mean “not terrible” in the sense that I somehow managed to choke it down — it’s interesting and totally drinkable. Chaider is a kissing cousin to the whole pumpkin spice cider family, if that’s the kind of thing you’re into, or think you might be into. Cinnamon and cloves are light but noticeable in the aroma, and the spices turn make it cloudy amber in the glass. There’s something about the flavor that’s more savory than your standard pumpkin spice set — cardamom, probably? — but it never gets too overpowering. 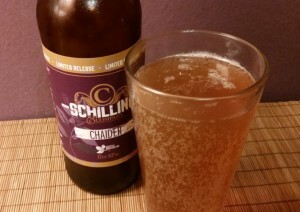 In fact, unless my memory is playing tricks on me, Schilling has managed to improve on last year’s chai cider recipe by moderating the overall spice level, making it less aggressive, more tempered and moderate. You’re definitely drinking chai cider, but it’s not going to reach out and demand the entirety of your attention. I’d like to have tried this against their “Spiced Cider” winter seasonal to more precisely identify where the two differ, but I haven’t managed to get my hands on any of that one. Think Chaider sounds interesting? Find some for yourself and give it a shot! And then tell Schilling what you think — I saw them asking on Twitter just yesterday whether anyone had tried it. Posted in Cider. Tagged 650mL, chaider, limited release, schilling cider. I don’t know why it is that my local Bartell’s seems to have a lock on every new flavor 2 Towns puts out, but I’m certainly not going to complain. Fly’n South is a limited release cider, clear light yellow and clocking in at 6% ABV, fermented with Oregon gooseberries. Keeping in the tradition of past 2 Towns ciders I’ve had, Fly’n South delivers as promised without going overboard. The gooseberry tartness comes through in the aroma, but not too much, and the flavor is moderately tart and dry. The most interesting part about this cider for me is that the gooseberries also somehow bring in an acrid, slightly ashy, smoky aftertaste. Again, nothing overpowering or unpleasant — just a reminder, as I drink, of summertime in the desert and the almost-taste in the back of your throat on the hazy days when you can see a plume of smoke off in the distance. It does transport me out of Seattle’s gray and gloomy winter, that’s for sure. Strange as it may sound, I think this cider came along at just the right time for me to appreciate it. Check out 2 Towns’ site and find some for yourself! Posted in Cider. 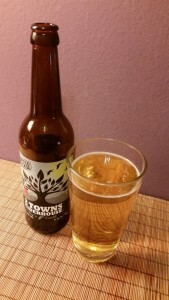 Tagged 2 towns ciderhouse, 500mL, fly'n south, limited release. 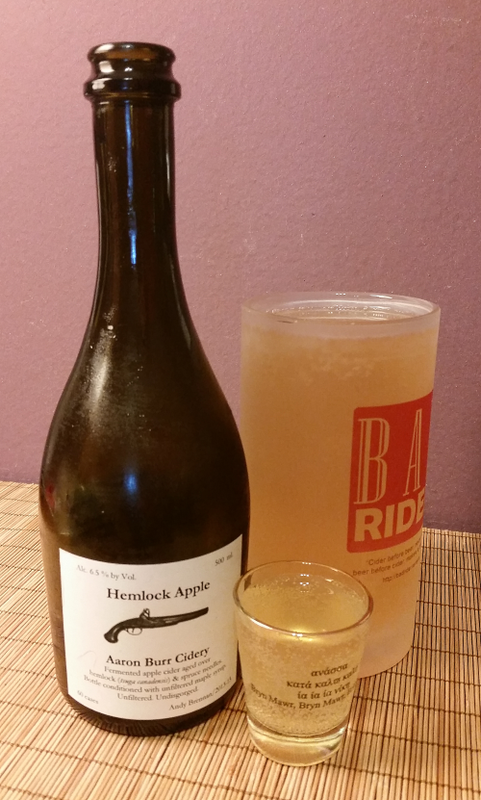 I’ve yet to find the Seattle Cider offering that really knocks my socks off, but they keep putting out solid, fairly interesting stuff, and the 2013 Washington Heirloom continues that trend. 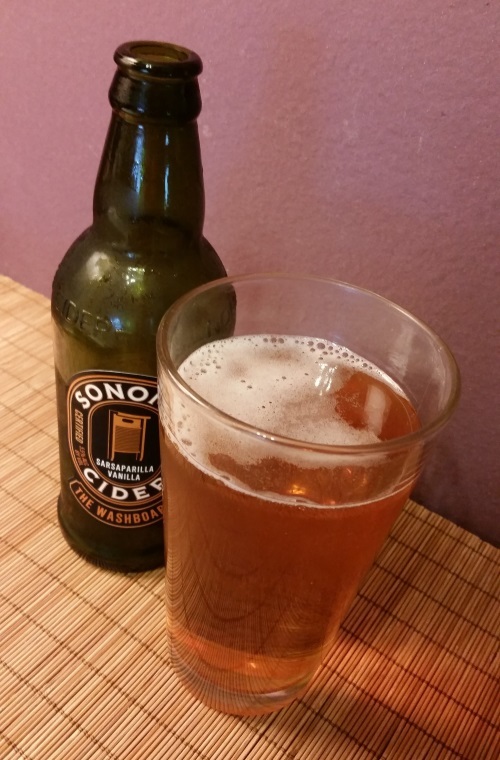 This 6.9% ABV cider introduces itself with a syrupy-sweet aroma, edged in sourness, and pours a clear light yellow, fairly fizzy. The aftertaste is cool and crisp and a little woody, but doesn’t last long. To me this is a cider that tastes like winter: cold fruit from the ground, cold wood, the snap of cold air in your lungs. Seattle Cider isn’t kidding around with their limited editions — only 2400 bottles of this have been made, so if you’d like to try some, get yourself to a store and check it out. Posted in Cider. Tagged limited release, seattle cider, washington heirloom. It looks so unassuming, until you take a whiff. Being the kind of person who doesn’t usually take their Thai/Indian/Mexican food crying-spicy, I was dubious about this cider the first time I picked it up. THREE Pepper cider? I asked myself. It’s only one bottle, you can handle it, I replied. To myself. After I tried it, someone doing their own exploration of regional cider offerings asked me how it was, and in the months since I recommended it they’ve apparently been drinking almost nothing else. 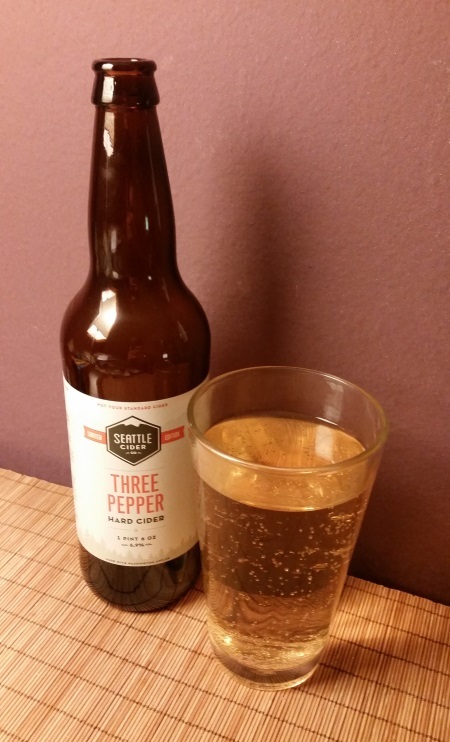 If you’re already ambivalent about the idea of drinking pepper cider, the aroma isn’t reassuring: it’s an immediate dramatic hit of jalapeno and capsaicin. To my surprise, though, this cider is more bark than bite — when you actually take a sip you get mostly a medium-sweet cider, with some fresh pepper flavor and fire that hovers around the outside and eases in toward the finish. The heat from the peppers lingers in the aftertaste, and the quicker you chug it down, the more it’ll make itself known, but over the course of a bottle it never gets to the point where it bothers me. I’m a bit at a loss trying to think of what kind of meal you might pair it with — something else spicy, probably, but not so spicy you want your drink to save you. Track down some Three Pepper for yourself here. It says small batch/limited edition, so you may have a hard time finding any, but I’ve seen it in my local store for months, so then again maybe not. Posted in Cider. 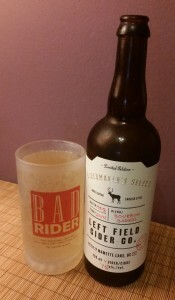 Tagged 650mL, limited release, seattle cider, three pepper. My love of muscat goes at least back to college, when I discovered Kasugai fruit gummies and ate a copious amount of them, especially the muscat and melon flavored ones. As I eventually developed a taste for wine, at first I leaned toward sweet wines such as muscats, and now that I’ve tried 2 Towns’ Cidre Muscato it’s not a surprise that I enjoy it as well. It’s a clear, pale yellow, almost a tiny bit greenish even, and has a definite recognizable muscat aroma, light and sweet and sharp. It’s definitely sweet — like a muscat wine would be, not syrupy. It really does taste rather like a muscat wine profile is sort of overlaying the cider. There’s an immediate hit of sweetness in the taste, and some acid, but then it dries out and develops into something more complex before fading and leaving an echo of grapes lingering in your mouth. 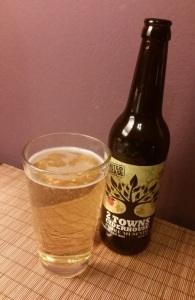 Overall, this cider seems lighter than a comparable muscat wine would be — understandable, since muscat wines tend to be 10% and up in ABV while this is only 6.9%. As far as I’m concerned, it’s another hit from 2 Towns. Locate some for yourself here! Posted in Cider. Tagged 2 towns ciderhouse, 500mL, cider reviews, cidre muscato, limited release.